Cal-Mil 329-18 Clear Standard Rectangular Bakery Tray Cover with Long Hinge - 18" x 26" x 4"
Chicago Metallic 40910 Gold Full Size Customizable Bakery Display Tray - 18" x 26"
Chicago Metallic 40912 Non-Textured Full Size Customizable Bakery Display Tray - 18" x 26"
Chicago Metallic 40917 Silver Full Size Customizable Bakery Display Tray - 18" x 26"
Winholt WHP-1826GABS Green Polystyrene Display Tray - 18" x 26"
Winholt WHP-1826WABS White Polystyrene Display Tray - 18" x 26"
Protect your delicious pastries, croissants, muffins, doughnuts, and more with the Cal-Mil 329-18 18" x 26" standard rectangular bakery tray cover with long hinge! 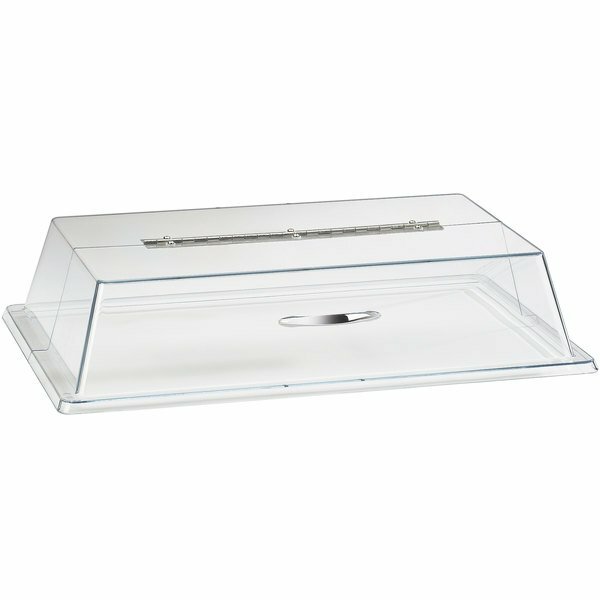 This clear polycarbonate cover keeps your baked treats fresh and sanitary while remaining visible to encourage impulse buys. Thanks to the convenient hinge, customers and employees can easily access baked goods without having to remove the entire tray cover, providing better protection and sanitation. Simply lift up on the attractive silver metal handle to reveal all of your most popular pastries, breads, and sweets on your 18" x 26" display trays (sold separately). Overall User Rating: Cal-Mil 329-18 Clear Standard Rectangular Bakery Tray Cover with Long Hinge - 18" x 26" x 4"
These covers work great as a clear, durable top to our pans of homemade cinnamon rolls. They have held up well for years and are easy to clean. Great cover.